psychopathy contributes to aggressive behavior, such as antisocial punishment behavior. Patterson, Kupersmidt, & Griesler, 1990). social rejection for the lateral receiver of the support. A lack of parental support facilitates aggressive behavior. 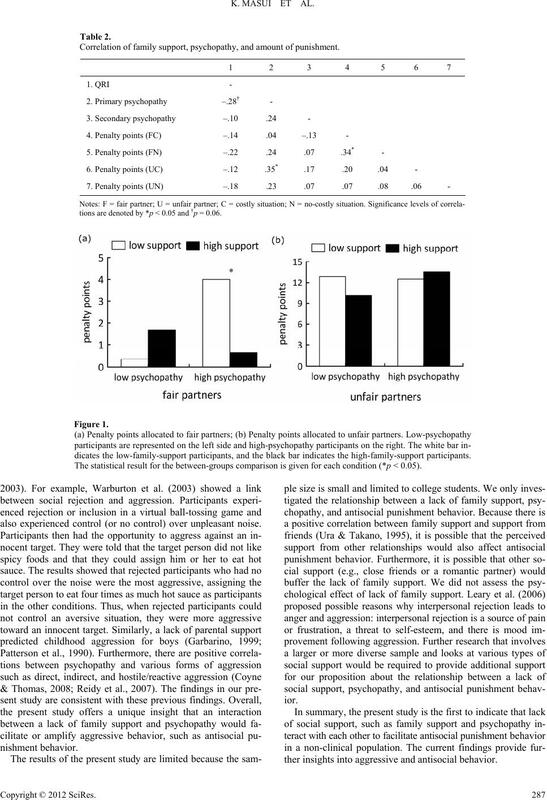 sponsibility, shallow emotions, and impulsivity (Hare, 1998). 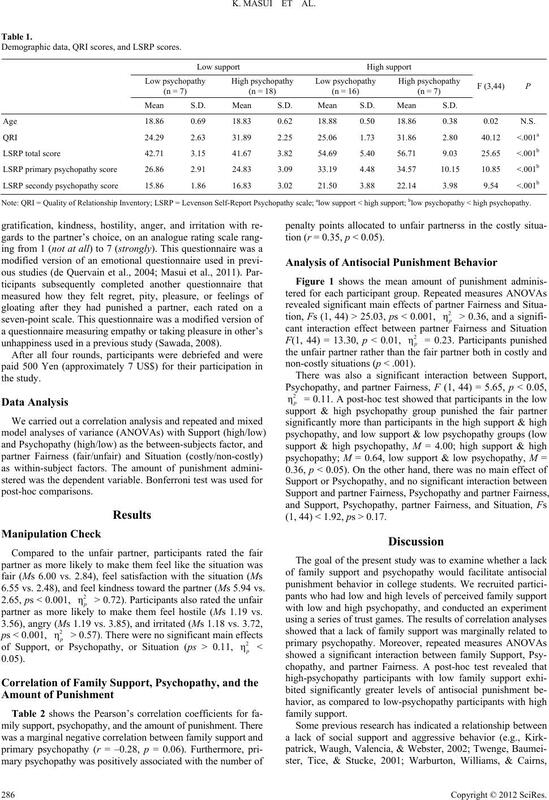 of psychopathy (Reidy, Zeichner, Miller, & Martinez, 2007). psychopathy might be expected to facilitate aggressive behavior. barino, 1999; Patterson et al., 1990). high family support or low psychopathy. Hiroshima University approved the study protocol. Family support. Family support was assessed by the QRI. disagree to agree), which had adequate reliability (α = 0.72). impulsivity, quick-temperedness, and poor behavioral control. 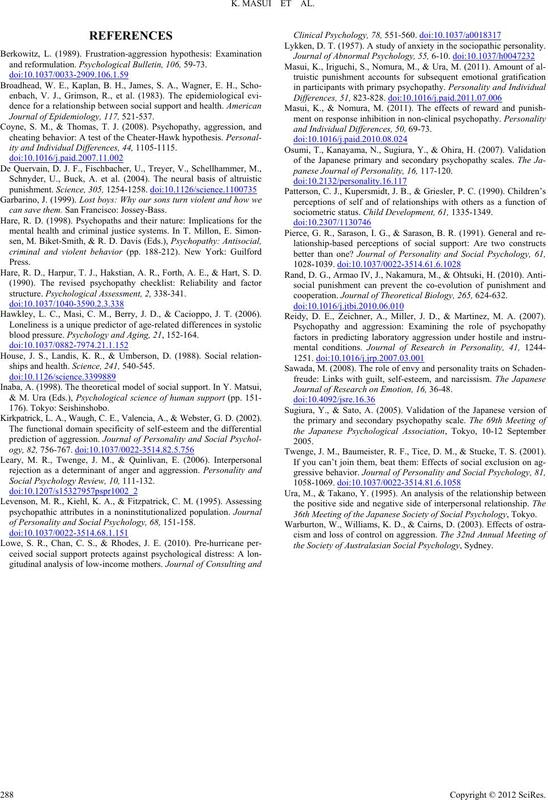 the low psychopathy groups (see Table 1). money at the end of the experiment (10 points = 30 yen). such that the partner lost double the points assigned as a penalty. pants had prior knowledge of the rules at any step. Demographic data, QRI scores, and LSRP scores. Mean S.D. Mean S.D. Mean S.D. Mean S.D. Age 18.86 0.69 18.83 0.62 18.88 0.50 18.86 0.38 0.02 N.S. Note: QRI = Quality of Relationship Inventory; LSRP = Levenson Self-Report Psychopathy scale; alow support < high support; blow psychopathy < high psychopathy. 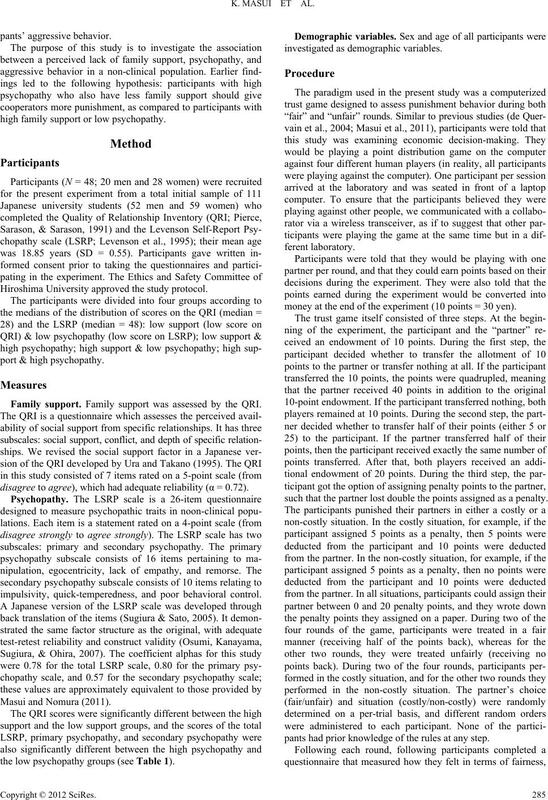 unhappiness used in a previous study (Sawada, 2008). 6.55 vs. 2.48), and feel kindness toward the partner (Ms 5.94 vs.
partner as more likely to make them feel hostile (Ms 1.19 vs.
tion (r = 0.35, p < 0.05). non-costly situations (p < .001). (1, 44) < 1.92, ps > 0.17. 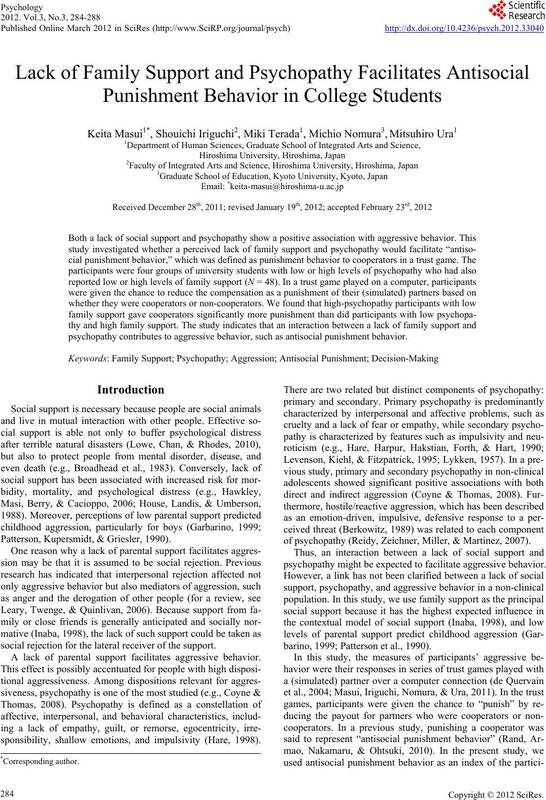 Correlation of family support, psychopathy, and amount of punishment. tions are denoted by *p < 0.05 and †p = 0.06.
dicates the low-family-support participants, and the black bar indicates the high-family-support participants. The statistical result for the between-groups comparison is given for each condition (*p < 0.05). also experienced control (or no control) over unpleasant noise. ther insights into aggressive and antisocial behavior. and reformulation. Psychological Bulletin, 106, 59-73. Journal of Epidemiology, 117, 521-537.
ity and Individual Differences, 44, 1105-1115.
can save them. San Francisco: Jossey-Bass. Hare, R. D., Harpur, T. J., Hakstian, A. R., Forth, A. E., & Hart, S. D.
structure. Psycholo g i c a l Assessment, 2, 338-341. Hawkley, L. C., Masi, C. M., Berry, J. D., & Cacioppo, J. T. (2006). blood pressure. Psychology and Aging, 21, 152-164.
ships and health. Science, 241, 540-545. Kirkpatrick, L. A., Waugh, C. E., Valencia, A., & Webster, G. D. (2002). Social Psychology Review, 10 , 111-132.
of Personality and Social Ps y c h o l o g y , 68, 151-158. Lykken, D. T. (1957). A study of anxiety in the sociopathic personality. and Individual Differe n ces, 50, 69-73.
panese Journal of Pers onality, 16, 117-120.
sociometric status. Child Development, 61, 1335-1349.
cooperation. Journal of Theoretical Biology, 265, 624-632. Reidy, D. E., Zeichner, A., Miller, J. D., & Martinez, M. A. (2007). Journal of Research on Emotion, 16, 36-48. Twenge, J. M., Baumeister, R. F., Tice, D. M., & Stucke, T. S. (2001). 36th Meeting of the Japanese S o c i e t y of S o c i a l Psychology, Tokyo. the Society of Australasian Social Psychology, Sydney.